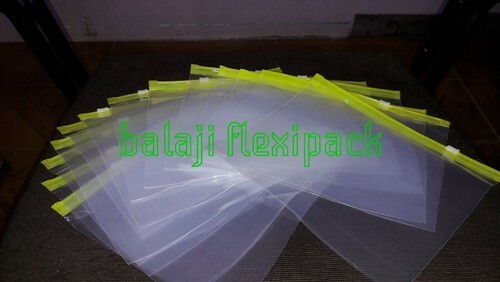 Balaji Flexipack, manufacturer, supplier, exporter and trader of this impeccable and diverse range of Packaging Products, established its operations in the year 2004. The range made available by us, is inclusive of the finest Zip Lock Bag, Bubble Bag and LDPE Bags, having a high demand in the market. Making of this range is done in compliance with the set industry norms and guidelines, utilizing the finest raw materials and modern machines. Owing to this, the product is known to have its quality highly maintained and an impeccable strength and finishing. In addition to this, the product is known to be marked at the best rate possible. Our highly advanced and futuristic infrastructure goes through regular up-gradation for reasons of boosting our presence in the market. The facility laced with all the necessary machinery and equipment, facilitates the attainment of several of the firm’s predefined goals and objectives. To manage the operations of the facility in the best possible manner, the firm, has been parted into several highly operational units, which are under the governance of skilled employees. These units, with utmost precision and dedication, help the firm boost its production capacity. In addition, our highly ethical working habits have helped us generate a huge client base in UAE and Australia.